For my Monday vase this week I chose to cut some of these tall stalks to contrast with an iris that has just opened and the lovely pale and mid-blue Camassias. And on the outer edges I also added a white Geranium sylvaticum ‘Album’, which is not quite as prolific as the chocolatey purple G. phaeum but just as tall (about 60-70cms), and grows well in complete shade, adding lovely highlights to my North border. What are the highlights in your garden right now? Do you have particularly tall plants in May? Thanks go to Cathy, who hosts this wonderful meme at ‘Rambling in the Garden‘. Intense colours seem to be the order of the day. Very pretty, and I love that pale blue Camassia. The colors of gems in a vase with that blue sky–spectacular. I have a salvia growing way too tall (and wide). Making plans to cut it back, but then a hummingbird, bees found it last week, and yesterday: a hummingbird hawk moth. Oh, how lovely to see hummingbirds and the hummingbird hawk moths. I must look out for the moths now that my Centranthus is slowly opening! My mom’s favorite color was purple! A charming array of May gems in this weeks vase. A vase of pretty things. G phaeum is one of my favourites. Mine too! Such an easy plant! 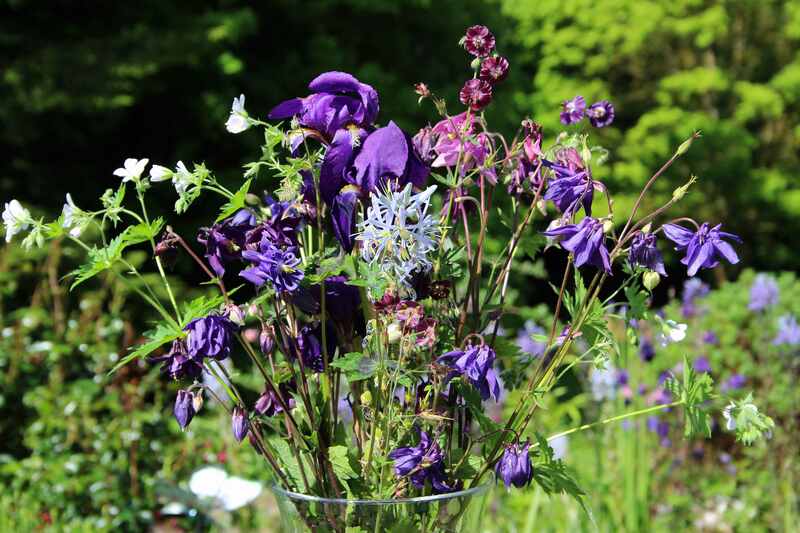 I love those purple Aquilegias and the way you combined them with other flowers, Cathy! Oh I think that I could replicate your vase of spring beauties Cathy, except for the camassia which is on my bulb wish list. Which variety is it that you are growing? I think this pale one was C. cusickii. But I also have the Camassia leichtlinii caerulea and Camassia quamash, both of which are a deeper blue and make more impact than the paler ones. I love the Aquilegia. Coincidentally, I picked up a Geranium phaeum (‘Raven’) at a local Geranium Society Show & Sale this past weekend – or perhaps you influenced me 😉 In any case, I hope it survives our current heatwave. One of the plants I used in my vase this week, Arthropodium cirratum, has bloomed on very tall stems this year and my cavalcade of Agapanthus is just getting started. Oh, I do hope your Geranium phaeum settles in well Kris! It will set seed really quickly! 😉 I hope my Agapanthus will flower this year… not so easy to keep them in our climate as they like a cool winter and the house is too warm for them but outdoors is too cold. Mine is two years old and still hasn’t flowered! 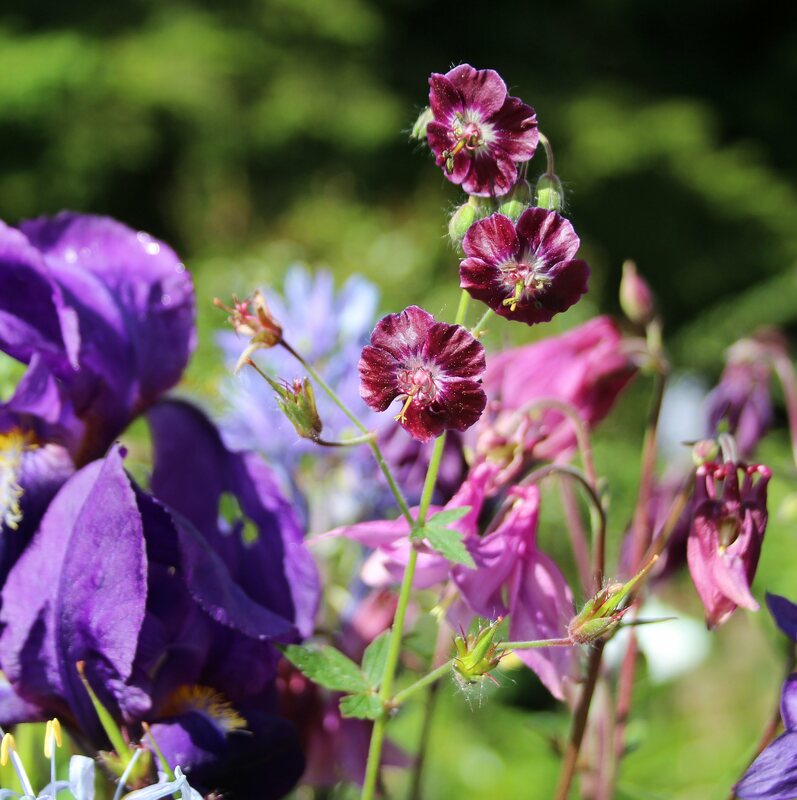 It always amazes me how tall the aquilegia grow – and of course I have that ‘mutant’ lily too! Your blues and complemetary purples work so well together and it’s interesting to read about your camassias which don’t seem to do well for me, but which I blithely keep trying! My Camassias didn’t do as well this year either… maybe too warm just as they flowered? The ground is also very dry here. I’m afraid little gets pampered in this garden – survival of the fittest! LOL! 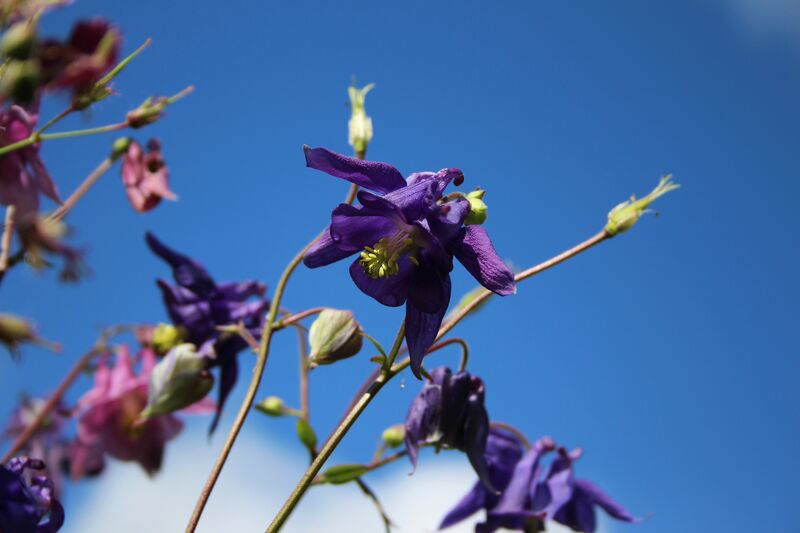 Cathy I love the Aquilegias, the Geranium phaeum and the beautiful Camassia with that color so beautiful blue sky. The bouquet is beautiful. Greetings from Margarita. Thank you Margarita. Hope all is well. Very pretty arrangement, Cathy! G. phaeum and Camassia are my favorites – May provides such bounty! Very nice! I especially like how you used the Amsonia – and the color of the Geranium sylvatica. I had to look up ‘Amsonia’ Jason… remarkably similar but these are Camassia. Not sure if they are related, but apparently both are North American natives. A blue that you might like in your garden? I have a good deal of Amsonia, also known as Bluestar. No, Camassia, though, an oversight that should be corrected. Both these Geraniums are absolute stars in my garden and the white one is perfect for a shady spot. Great colours! We are late in Northern Germany. Ours even start to bloom. We had moderate rain – no thunderstorms and heavy rain. Love the shades of blues and purples. I’m not familiar with Aquilegias, Cathy, but it is striking! I love the deep purple and it makes a beautiful a backdrop to other colors. Another really lovely arrangement. I love that deep purple iris! You have such a rich variety of flowers to choose from week after week, Cathy. It’s quite remarkable. I love your gorgeous header photo. Is that a poppy? Your photography is always stunning. They’re incredible and what fun to see them unfurl.